We Franciscans are challenged to live an integrated life through prayer, community, and our ministry as teachers. We live by our vows of poverty (living in simplicity), chastity (living in love with all), and obedience (living and witnessing the Gospel). My life as a Brother of the Poor of St. Francis is fulfilling and exciting because by living this lifestyle I can freely "shout" to my sisters and brothers that God is alive and gives real meaning and value to our lives. I can "shout" that Jesus truly lives within our neighbor and is waiting to be rediscovered and loved and served there. I can "shout" that brotherhood is the basic tool of a living Christianity -- a means to unite today's troubled and divided people. I was born and reared in Portsmouth, Ohio, a small city on the Ohio River. I have an older brother and a younger sister and brother. My brothers and sister and my now deceased parents and grandparents had a great influence on my life and my dicisions and responses. The Franciscan Sisters of Rochester, Minnesota, and Father Bill Johnson, as assistant in those days at my home parish of St. Mary's, also touched my life in significant ways. It is said that even when you're on the right track you'll get run over if you just sit there. These people (and many ohters) made sure I didn't just sit there! I had an interest in religious life, in becoming a brother, in the early 1960's, but I didn't do anything about it. For a while, I worked at a hometown hospital and then eventually enlisted in the Navy. After that, I went to work for the Federal Bureau of Investigation in Washington, DC. The thought of religious life still lingered in my mind and became more aggressive over the years. During my time with the FBI, I met several Franciscan Brothers. Their simple, humble and happy lives touched me. They seemed to be involved with all kinds of people, people who had many needs. 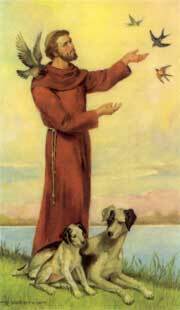 These Brothers, followers of St. Francis of Assisi, seemed to have a purpose, a goal, for the future. It was in 1968 that I became a Franciscan. At the time, some made remarks like, "you're crazy" or "Why become a Brother?" I'll admit that there was a great deal of doubt until I made the final decision to embrace the Franciscan way of life. Yet, looking back over these years, I see that they have been the happiest years of my life. The decision was worthwile and meaningful. For certain, I have thought about being a Brother far more after entering than before. Before entering at age 24, all I knew about being a Brother was that it mostly meant "none of this" and "none of that" and that I got picked to be one. Why was I picked? I really don't have one concise answer. It continues to be revealed bit by bit. Good thing, because if everything was revealed all at once it would be too much. Even if it is true that married or single life would make me just as happy or more mature at times, I know that the Lord has not called me to those Gospel responses. It is as simple as that! The vows of poverty, chastity and obedience have helped me tremendously in my response to the call to Brotherhood. Poverty has given me a carefree attitude toward the goods of this world and its signs of success. Even though obedience has, at times, been difficult, it liberates me in many ways. It has not blocked my initiative, but rather has guided it. On many occasions, it has encouraged me to go further toward my dreams and goals when I would hardly talk about them. Chastity allows me to live in love with all without possessing. Obedience provides me the gift of sharing my self-will with others in this special journey. Faithful prayer pulls it all togehter. During these Franciscan years, I've been blessed to be involved with many through ministry as an elementary teacher and principal, a director of a family shelter, and a pastoral minister. Through these wonderful opportunities, I realize that somehow I am wed to all. I realize there is one Brotherhood in the end. There have been many somersaults. My journey from the beginning to where I am now is proof. It has been quite a trip and I look forward with expectancy to all that remains. God has given each of us the mission to spread the Good News. It is true that we do not have to be specially dressed for the task, we do not need to be a member of a religious order, and we do not need approbation or recommendation. But, if anyone out there feels this call from God to respond and share the Good News through religious Brotherhood, please stop giving God so many instructions and just report for duty. In recent years letters from the Brothers' administration confirming our discernment for ministry have included the following statement: "May God bless you for your cintinued willingness to be a witness to Christ, be a living witness, who by your way of living and working and loving in His name and in the spirit of Francis of Assisi and John Hoever, our founder, tells the world that 'Jesus Christ is alive and in glory'." That statement explains why I am a Brother. Heaven knows that our society needs living witnesses to the transforming power of our Lord and of the Gospels. I didn't fully realize it at the time, but my disposition for becoming a religious was nurtured by a strong family life and the incredible faith of my mother. Our home in Altoona, Pennsylvania consisted of my parents, three sisters and a brother. I am the youngest. Mom died in 1987. Dad died more recently. My sisters and brother all live in Altoona, but some of my 15 nephews and nieces and their children live in other parts of the United States. When I was in the 8th grade, I went on a retreat at a local Franciscan community in Loretto, Pennsylvania. I was most impressed with the Brothers of that community. They were simple, fun-loving, and hardworking, but there was something more about them that I couldn't quite understand at the age of 13. I have since learned that it must have been their love of God that quietly attracted me to their lifestyle. 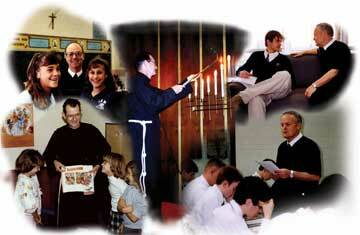 The seeds of a vocation were planted during the succeeding years. Many times in my years as a Brother, people have asked my "What made you become a Brother?" My answer: "it's not 'What' made me a Brother, but 'Who'." God calls, we answer. "Why not a prient?" is another frequest question. I can't answer that one. Only God knows why he prefers one vocation for an individual over another one. One thing I know for sure is this: the greatest in the Kingdom of God are not necessarily the ministers, but the saints. So I have "gone all the way" in my vocation as a Christian in relation to how much effort I have made to become holy. Brotherhood enables me to do this and so I remain a Brother and leave the sacramental priesthood to those who are truly called to it. Our vows of poverty, chastity and obedience are at times like the marriage vows. They are hard to keep. But they are Scripturally sound, and when faithfully kept, are the Brother's way to holiness. I took final vows in our community in March, 1968. Remaining faithful to these vows is a lifelong process. But the Lord is the reason for keeping these vows, and it is our belief that He will help us fulfill this commitment. My ministry as a Brother has been in education. I have taught junior high math and religion, and my present assignment is at a boys' high school in Little Rock, Arkansas, where I am a counselor and a French 1 and senior religion teacher. I have also been Formation Director and an Advisor for our Regional Minister. Presently, I am an Advisor for the General Minister of the Congregation. You, the reader, are certainly welcome to join us, the Brothers of the Poor of St. Francis. Our mission, our focus, is to spread the Good News of Jesus Christ. And when people call you "Brother", you will be constantly reminded of the fact that we are all equals in our spiritual journey, ready and willing to help each other to make the sacrifices necessary to curse the darkness so apparently present in our society. The foundation of the Congregation of the Brothers of the Poor of St. Francis by Brother John Hoever on Christmas Eve, 1857.
the Poor of St. Francis? Site Design/Maintenance by Slaughter & Slaughter, Inc.